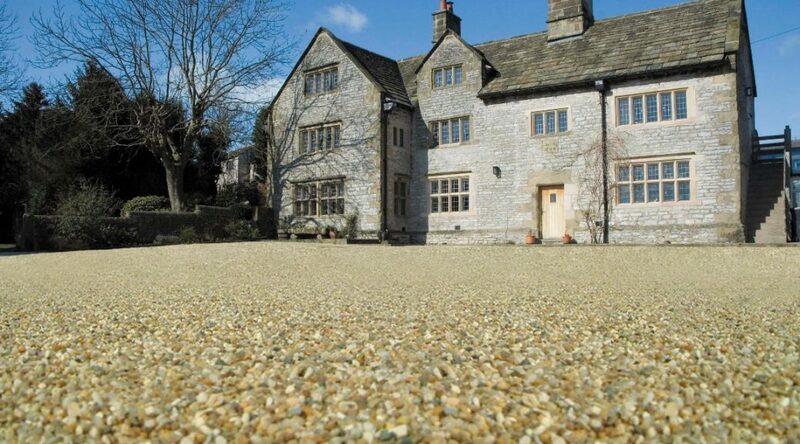 Using gravel on your drive is an attractive and cost effective solution. Additionally a gravel drive helps reduce the risk of flooding as water can drain away freely unlike concrete or tarmac drives. Creating your gravel drive is relatively simple but can be hard work! We have put together a useful step by step guide to assist you through the process. Step 1 – Remove the existing base. This is probably the hardest part of the process as potentially involves a lot of digging! Remove the existing base so that you have firm ground underneath (not topsoil). Take care when digging and ensure there are no service pipes that could be damaged e.g. gas, electricity, water, phone drainage and sewer. The sub-base of the drive is really important as needs to be able to support heavy loads. We suggest using a sub-base that consists of various sized pieces of aggregate that compact together such as MOT Type 1. Ensure you have ordered the correct amount of sub-base, we suggest laying it to at least a depth of 50mm. Normally 1 bulk bag of MOT Type 1 will cover approximately 10m² at this depth. You can use a wacker plate or roller to compact the sub-base and ideally the base should slope away from your house or garage. The weed membrane should be laid directly under the gravel on top of the sub-base. Therefore roll your membrane out to cover the soil and peg into position. We have created a handy video on choosing the right gravel for your drive. Ideally select something that is hard wearing, angular and 14mm or 20mm in size. Ensure you have calculated the correct amount, normally 1 bulk bag will cover approximately 10m² at a depth of 50mm. Popular products for drives include any of our Granite Chippings, Golden Gravel, Moonstone, Black Ice and Heritage Quartz. If your area is on a slope and you need to lessen the movement of your gravel you can install gravel grid at this stage. It is very quick and easy to install, please click here for our useful video on how to install your gravel grid. If you don’t use a gravel grid then you can simply tip the chippings onto the base layer and rake into place.